In the countryside of Katsunuma, Yamanashi Prefecture, just north of Mt. Fuji, a family-run operation has been making wine the old-fashioned way for almost a hundred years: squeezing grapes by hand inside wooden presses. Every year in mid-October, Hitoshi Mitsumori, 54, along with his wife Kaori, 53 and son, Motofumi, 27, get together with other local farmers to process freshly harvested Koshu white wine grapes, a variety indigenous to the prefecture. 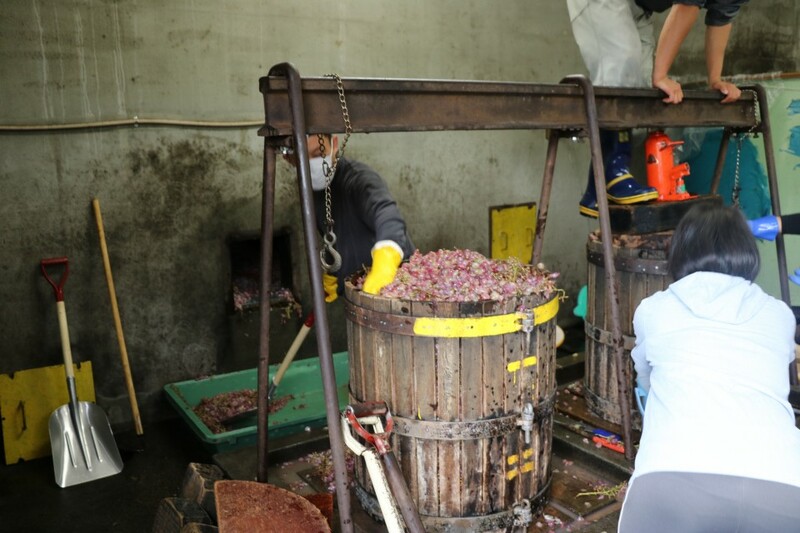 Over the course of about three days, farmers from the Hishiyama district haul in about 13 tons of Koshu grapes, which after being fermented on site are returned to their owners the following spring in 1.8 liter and 720 milliliter bottles of "budo-shu" wine. "Nowadays, big wineries use automated machines to crush their grapes but we use wood baskets and crush them by (levers)," Hitoshi said in a recent interview at the shop Budobatake. "If you put the grapes in expensive machines, the cost of the wine we drink will get expensive. By using the traditional techniques from the past we can lower costs," he said. Although not likely the first thing to come to mind when thinking about Japan, winemaking has in fact been around in the country since the late 19th century. According to Suntory Holdings Ltd., Koshu grapes, known for their fruity bouquet and floral notes, were developed from grapes that came to Japan along the Silk Road in the Nara period (710-794) through the Heian period (794-1185). But it wasn't until the late 1870s that private wine production started for the first time in Japan, thanks in part to two young expats who had studied winemaking techniques in France. Wine consumption along with production greatly increased in the prefecture and across Japan from the second half of the 20th century, mainly due to the change to a more Western diet after the Japan World Exposition in Osaka in 1970. According to the National Tax Agency, Yamanashi was the top wine producer in the country with shipments of 5,510 kiloliters, or 33 percent of national output, in fiscal 2016. High-quality wines from the region have made headlines by winning international competitions in France. Budobatake's vineyard (growing 48 types of grape) is located in an alluvial fan at an altitude of about 500 meters behind the family's store, where Kaori is in charge of selling customers a variety of table grapes depending on their harvesting seasons, including Kyoho, Fujimori, Shine Muscat and Delaware grapes. Because of its location on a 30-degree incline with winds that gust down from the mountain, ample sunlight and excellent drainage conditions, the vineyard is ideal for growing delicious grapes. Budobatake is known as the central wine fermentation site in the Hishiyama district of Katsunuma, one of Japan's most famous areas for growing fruit, such as peaches, plums and grapes. 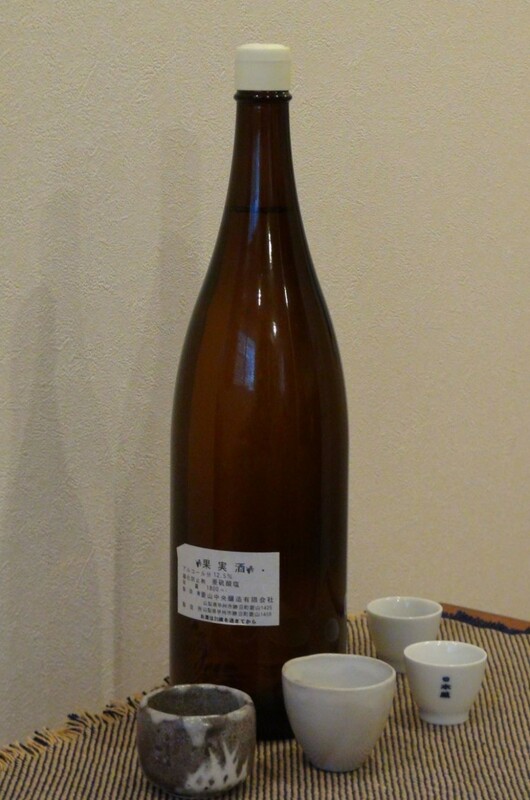 Budobatake makes a distinction between the budo-shu (literally, grape alcohol) it produces and wine. For the family and local farmers, it is the old-fashioned wooden pressing that expresses their heart and soul and brings out the full flavor of the grapes. "In Japan, we don't think of this as wine culture but budo-shu culture. We call it budo-shu," says Kaori, who also holds a license as a wine advisor. In the culminating event of the season in late autumn following the harvest, local farmers bring whatever Koshu grapes they have left over after sending out their shipments and work on processing the budo-shu in a mass "labor of love." About 30 local farmers gather each day, enlisting help from farmers outside the prefecture as well. They work in shifts on the wooden grinders and presses, paying 1,000 yen ($8.85) each with a lunch thrown in and closing party to participate, from around 8 a.m. until about 6 p.m., finishing with a mass cleanup. First, damaged grapes are removed from their bunches. 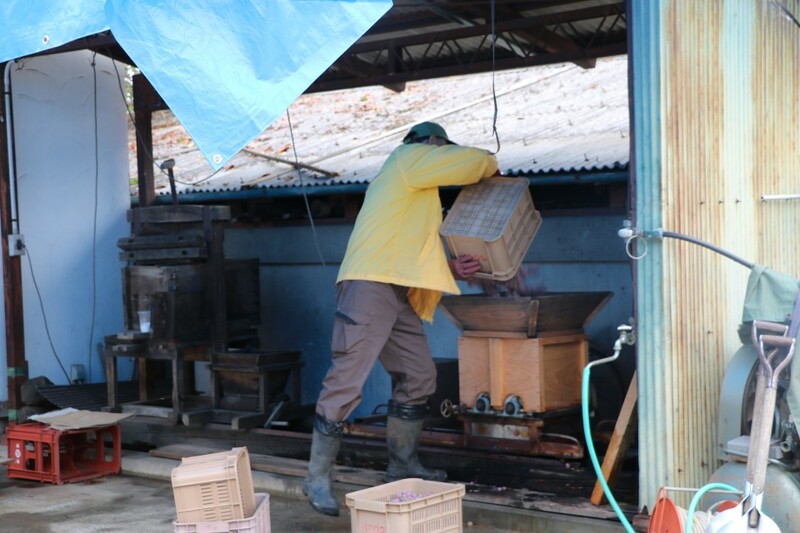 After the local farmers' grapes are weighed individually, they are gently crushed in wooden grinders -- just enough to break open the skin -- and destemmed, thus making it easier to squeeze juice out in a wooden press. The grape juice is separated from the solids left over, which are returned to the vineyard to be used as compost. 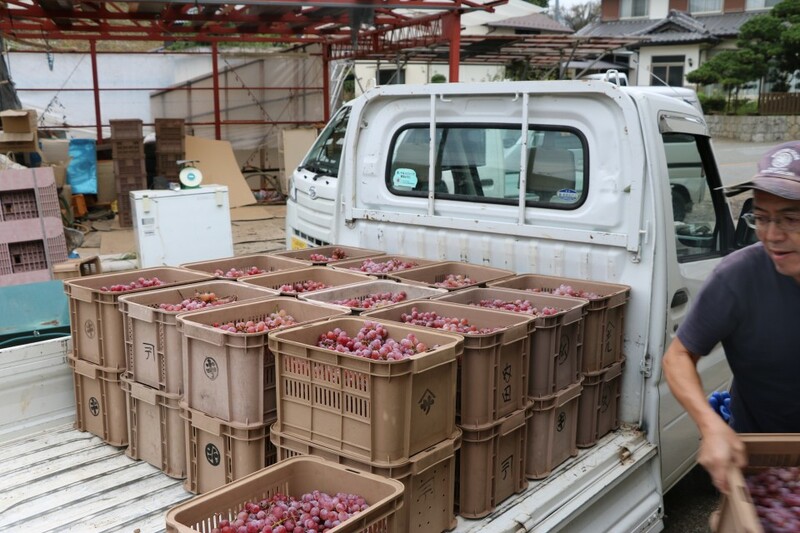 "The juice from the grapes is put into these tanks and fermented and ripened," Hitoshi says, adding that the number of bottles local farmers collect in the spring is determined by the weight of grapes they brought. Budo-shu is a particularly good match for Japanese cuisine, says Hitoshi, who along with his son Motofumi is in charge of the fermentation process. "The farmers drink their wine at dinnertime and social gatherings but also ceremonial occasions. It's a longtime tradition of the Hishiyama district," he says. Although most of the budo-shu will mature in their tanks over the winter before the farmers come again to bottle and cap their wine in March next year, a small amount is bottled especially before Christmas in time for the New Year. Budobatake also holds study tours of its grape-squeezing process as well as budo-shu and grape juice tastings. The shop sells a large 1.8 liter (1 sho bottle) dry budo-shu for 3,500 yen, while the smaller 720 ml bottle goes for 2,160 yen. The shop also sells an assortment of other items, including grape jams, raisins and fruit gelato. For the Mitsumoris and local farmers, the passing of the torch to successors in an aging country with a shrinking population of farmers is a priority. Hitoshi's father, Kesaji, 88 this year, is from the second generation of grape farmers. Kaori, who is active as a leader of female farmers not only in her region but across Japan, says getting people to think about the future of fruit farming is the most important thing. She defines a leader as "a person who takes action for the region." "For fruit farming each one of us is a leader. What's special about this area is we have study groups. It is rare to find people who are thinking about how the region will be in the next several decades. So we have to cultivate capable people who can think about five, 10, 20 years down the road," she says. Her husband is of like mind. He says the future of their industry depends on creating a structure where producers can connect with consumers, especially amid the liberalization of economic markets through multilateral international trade agreements. "To keep this region of production alive we have to pass on the history, culture and traditions as well. There needs to be a system where young people can earn money in cities like Tokyo and support regional areas, and rural areas need to be able to accept this. This will lead to having a more stable market," he says.